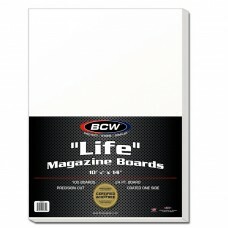 BCW Magazine Backing Boards are Acid Free and Buffered with 3% Calcium Carbonate. They fit inside BCW Magazine Bags - available separately - and protect the spine of your magazines from bending during storage. Available in standard and Life magazine sizes.